On holidays, special days, or every day, avid collectors and beginners enjoy decorating with miniature pieces from the classic Charles Dickens tale, "A Christmas Carol." Inspired by the cobblestone streets, gas street lamps, and horse-drawn carriages of 19th century, the "Christmas Carol" collection is a beloved one from Department 56. Visit Belle's House and meet the Cratchits with lighted buildings and accessories. 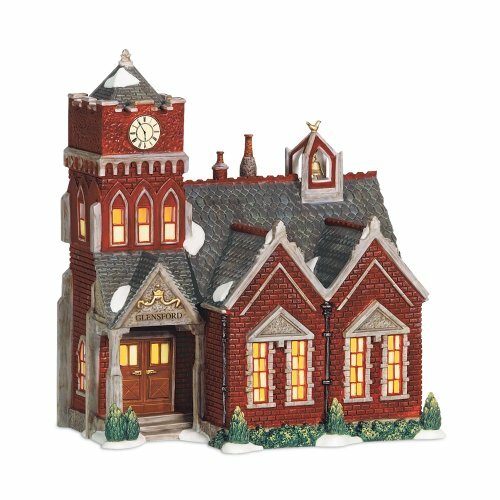 The "Glensford School" is crafted of porcelain and hand-painted. Introduced in December, 2008, this piece measures 7-1/2 by 5-1/2 by 8 inches. Each building and accessory in a Department 56 village collection is a beautiful combination of authenticity, whimsy, and enchanting touches designed to warm hearts and homes. Artists develop a town plan for each village, then every detail is carefully thought through and drawn. Sculptors create three-dimensional wax sculptures using skilled hand artistry that results in an incredible level of detail. Each piece is molded by hand. All buildings and accessories are fired for several hours at high temperatures to provide the highest quality and durability. Shrinkage during the firing is planned into the design to accommodate things like die cast details and electric motors. Each building and accessory is painted by hand and then fired a second time to give more durability to the color finish. Finished pieces are carefully packed in protective foam and shipped, after passing a drop test to meet strict quality control standards. The packaging for each piece is custom designed and is meant for long-term use as protection and storage for when pieces are not on display. To care for and clean pieces, use a soft brush or feather duster to remove surface dust. Using a hair dryer on a low, cool setting, or using canned air (used to clean computer components) is also effective to remove dust. Do not use a liquid spray, water, or a soapy water solution to clean pieces, as this may damage the finish. If minor repairs are needed, Super Glue gel formula is recommended as a repair agent. Please be sure to remove all other adhesives before repairing. Old adhesives can be safely removed by using a hairdryer to soften the old glue.